Summary SUSPIRIA is a supernatural horror film in which a woman joins a world renowned dance troupe following the mysterious disappearance of their lead dancer. 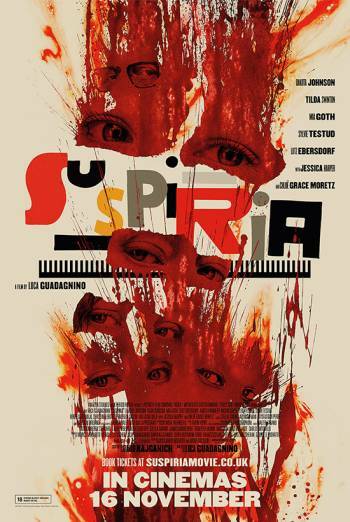 SUSPIRIA is a supernatural horror film in which a woman joins a world-renowned dance troupe following the mysterious disappearance of their lead dancer. There is a bloody neck slash and a scene in which a woman is killed with a metal hook, resulting in sight of gory injury detail. During a ritual, bodies combust in sprays of blood. There is focus on a woman's intestines spilling out of her stomach after she is cut with a knife. A woman's body is contorted in to an unnatural shape, causing her bones to break. There is very strong language ('c**t') and use of strong language ('f**k'). There are scenes of sustained supernatural threat.